Vocal Pluses:Donna summer was a rear creature, in that though a technical singer with expert control over her instrument, she was also one capable of delivering emotion too. Whether oozing seduction- Love To Love You Baby- lamenting the loss of love-MacArthur Park- or giving attitude- Bad Girl- Donna Summer knew how to manipulate her voice to bring the meaning of her lyrics to life. Her skill as vocalist meant that she was able to hold a note effortlessly- No More Tears (Enough is Enough)- and able to sing complex melisma throughout the range without issue. She also had a vibrato that could be manipulated in speed depending on the effect required. The bottom of her range was dark, weighty, and slightly breathy at it's lowest extremes. However, it became more comfortable and fuller around the halfway mark of the third octave and continued to gain in confidence and character as it reached up into the midrange. The midrange was solid with a hypnotic ease to it- Could It Be Magic. It was well connected both to the lower range, and the belting range above it. This allowed Donna Summer to move through these three parts of her range effortlessly, giving the impression that her modal voice was one seamlessly connected instrument. The timbre of this part of her range could also be altered in solidity, meaning she could sing in a solid tone, or a breathy, lighter one that harmonised exceptionally well- I Feel Love. Donna Summers belting range was clear, resonant and cooler in colour than her lower range and her head voice. Though the voice lost projection as it got higher up the fifth octave it was mixed so well with the head voice that no tension or muddying of the sound was detectable. Even up to a note below the sixth octave the voice remained crisp, piercing, effortless and with a noticeable fullness to it. Perhaps Donna Summer's head voice demonstrated her skill, versatility and control as a vocalist best. Here she could choose to sing with an opera like tone, that produced notes that were measured, warm and rounded: if a more contemporary style was required she could produce notes that were sharp, cutting and solid: Or, in contrast to this, she could utilise a timbre that was smoky, and almost moist in texture. These three applications of the head voice, and also how well her voice harmonised with itself, can be best be heard on I Feel Love. Vocal Negatives: The lowest notes of her range sounded slightly forced and reached via unhealthy technique. I'm confused, if her head voice demonstrated her skill the best, wouldn't she be a soprano? Didn't realize she had such a direct in into "god's mind" but anyway, here's Donna in 2006. Thought it sort of appropriate. Thats more to do with her skill and technique as a vocalist. Her midrange, and her lower belting range, is where I actually think the voice is most comfortable. Also, the consistent weight of her voice also makes me veer towards a mezzo. 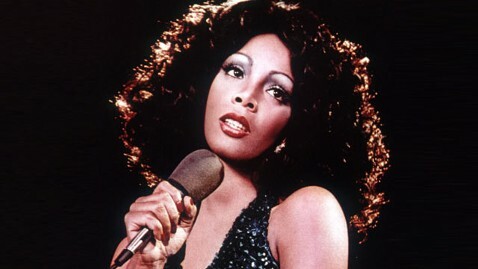 RIP Donna Summers. You were a great preformer. Last time I saw Donna was 2009 in LA show ... Her voice was like fine wine. She didn't need a microphone to rock any place. I miss her so much ! Before I did comprehensive research, I had only a rudimentary understanding of vocality. I assumed that Donna Summer was a contralto, given how she mostly stuck to lower notes similar to Laura Branigan, who was a contralto--and whose voice hers most closely resembled to my subjective ears. But then I learned of "tessitura" and realized that Donna Summer had a much lighter voice than Laura, which enabled her to sing higher notes more effortlessly, which is when it became clear that she was indeed a mezzo. DD, I hope that you will do a profile on Laura Branigan soon. Some uninformed person cited Laura's name under Wikipedia's "List of Sopranos in Non-Classical Music." Based on the research I've done on your site and many others, Laura Branigan was by no means a soprano. However, I cannot find any sources considered "reliable" by Wiki to counteract that inclusion. Apparently, your site is considered reliable, having been cited under Adam Lambert's main page. A highly underrated vocalist who had great technique and knew how to use her voice! She was practically flawless except I agree, her lower range could have been stronger. The clarity and resonance here is just astounding! Her voice was one of the most beautiful and purist of our time. Nobody comes close to Donna, nobody. Wouldn't exactly call Donna "our time". Her Stage name was Donna Summer = no 'S' at the end ! And you can't dissect the notes in her voice & give a rating of how good or bad she was. That sort of crap leads to Mariah Carey et al being thought of as Great Singers. This picking apart is ridiculous. Donna voice was absolute perfection, she could sing anything! Love Donna summer. No other vocalist ever has sent chills through me on a regular basis. The tone, texture, and many vocal interpretations of her voice always honored the song and not just her. She seemed very humble and I miss her greatly. Hope some new things will pop up soon. .
Donna did not need a mic. She had the most powerful voice I have ever heard. She had great control and knew the essense of the song so as to prhase it as if it were life itself. Pure emotion!